Hurricane Matthew will stay well south of New Jersey over the Columbus Day Weekend, but could still contribute to enhanced rainfall, wind, and surf. As of this writing, Hurricane Matthew is clobbering the Atlantic coast of Florida. The only solace so far for places like Miami, Ft. Lauderdale, Delray Beach, West Palm Beach, and Port St. Lucie has been the most dangerous portion of Matthew - the eye wall - staying over the ocean. Just barely. Here in New Jersey, we have another nice early autumn day on the docket for Friday. Increasing clouds are expected, however, which may make the afternoon a bit grey (especially in South Jersey). High temperatures will be similar to Thursday, in the lower to mid 70s. Hurricanes are moisture machines. 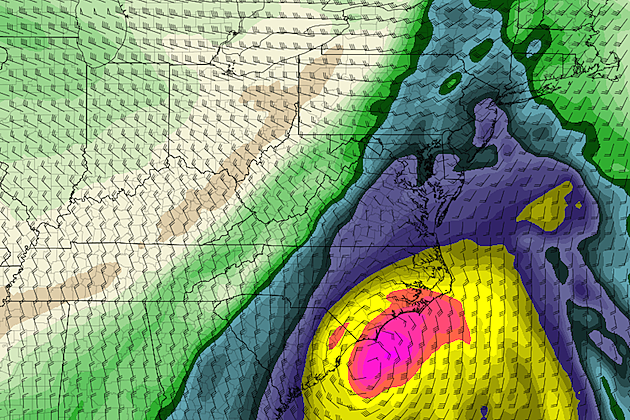 Unsurprisingly, some of that moisture is expected to slide up the U.S. East Coast through Friday and Saturday. So, as our aforementioned cold front presents the chance for light rain in New Jersey on Saturday, it may transition to periods of moderate rain instead. Certainly nowhere near "hurricane" conditions, though - rainfall totals will average about a quarter-inch across the state, with maybe up to an inch in spots if it really deluges. Models have been quite uncertain surrounding the timing of the rain, but our best chance for rain looks to be Saturday afternoon to evening. Behind the cold front, an area of high pressure will build into the Northeast U.S. This new air mass will be cooler and drier, so at least we'll clear away to sunshine very quickly on Sunday. However, the gradient between the high pressure system and the extreme low pressure of Hurricane Matthew will likely increase the wind speed on Sunday. Sustained winds of 15 to 25 mph are expected, with occasional gusts as high as 35 mph. Again, not even tropical storm force winds. And not strong enough to cause widespread damage. It just might get a bit blustery on Sunday, especially given an impending cooldown from comfortable 70s to autumnal 60s. Usually, when there is a major hurricane in the Atlantic basin, we have to watch the surf conditions at the Jersey Shore very carefully. But honestly, things are looking pretty good for NJ this weekend, thanks to the prevailing wind direction (not perpendicular to the coast), and thanks to geography too (the coast of North Carolina and Virginia will help "block" some of the storm swell). While the combination of Hurricane Matthew and Hurricane Nicole could produce up to 5 foot waves along New Jersey's beaches, coastal flooding is not expected.